A great choice for dial-up and light use, but there are far superior high-speed broadband internet options available. Although EarthLink places a heavy, yet welcome, emphasis on security and is unbeatable on price, their customer service can be underwhelming, and the array of potential hidden fees is eye-watering. At less than ten dollars per month, EarthLink’s dial-up option is perfect for the budget-conscious consumer. Due to the low download speed, it’s best for light use, such as shopping, banking, checking emails, and everyday browsing. EarthLink also provides phone numbers that cover the length and breadth of the country, allowing you to access the internet from pretty much anywhere with a phone line, all included in the price of your plan. There’s no cap on data, and you’ll also have up to eight email addresses with automatic virus detection and spam blocking. EarthLink’s entry-level broadband plan is the DSL Internet service at $14.95 per month. Again, it’s inexpensive, and the jump in speed for an extra five bucks is certainly worth considering if you have the means. It’s not blisteringly fast, with top speeds of 15 Mbps, but it’s a great option for light users who still want to stream and use more than one device at a time. Hyperlink Internet is EarthLink’s flagship high-speed fiber optic service, and at $39.95 per month, it’s on par with other providers. However, there are catches and hidden fees that aren’t seen elsewhere. Take the modem, for example; it’s an extra 75 bucks, and mandatory professional installation is an extra 70. You’re also tied-in to a 12-month contract, and there’s a $200 fee for early termination. When stacked against other providers that tend to offer either free equipment, complimentary installation, contract flexibility, no termination fee, or a combination of cost-saving features, the Hyperlink Internet package rapidly loses its sheen. Finally, there’s a satellite option for remote and rural communities. This was previously an independent service within EarthLink, but it’s now powered by HughesNet. For $49.99 a month, speeds of up to 25 Mbps are achievable, although this depends on your location and atmospheric conditions. Satellite internet can be less reliable than wired alternatives, but this problem is not unique to EarthLink. 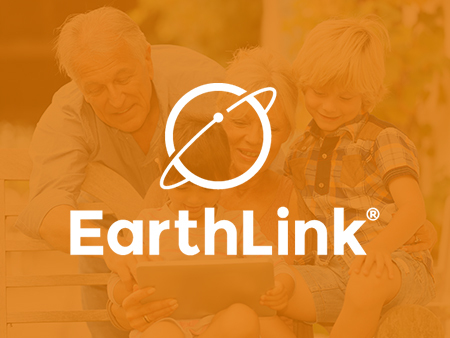 EarthLink’s pricing model is reasonable when compared with other prominent satellite internet providers; in some circumstances, it’s actually a little cheaper than the standard HughesNet service. As mentioned above, EarthLink charges almost $145 for broadband equipment and installation, which is mandatory for use of their services. The router itself is Wi-Fi–enabled, allowing any device within your home to access the internet without having to worry about wires. EarthLink also makes a charge for its dial-up modem, but this can be avoided by sourcing your own equipment. Fortunately, there’s no charge for installation, as it’s just a matter of connecting the modem and setting up a software that EarthLink sends in the post. Installing dial-up equipment is straightforward, and the installation software will guide you through the simple activation process. At just shy of ten dollars per month for dial-up and fifteen for entry-level broadband, no other internet service provider comes close to EarthLink’s cost-saving credentials. If you’re working on a tight budget and have priorities more important than bells-and-whistles broadband, EarthLink offers a viable alternative. Although download speeds have progressed dramatically since the heyday of dial-up, this simple approach to connectivity still has an important purpose, which makes EarthLink’s continued offering quite admirable. Not all internet users have heavy-duty requirements. Whilst streaming and online gaming are an essential part of modern life for many people, others have lighter internet demands. There’s no need to spend excessive amounts on an elaborate package if your household only needs enough data to send emails, check the news, make an online order, and do some internet banking. The DSL Internet option is perfect for people who are light users but want the flexibility of extra capacity and Wi-Fi connection when required, while the dial-up plan is an excellent choice for those who are happy to keep their connection to one computer, or wish to complement a generous mobile data plan with a backup option. If you opt for the dial-up service from EarthLink, you needn’t worry about restriction. There are no limits on data usage on dial-up plans. Our cynical side would like to point out that it’s unlimited solely because the download speed is excruciatingly slow, but the sentiment is appreciated, nonetheless. EarthLink is serious about security, and customers are very happy about it. Antivirus software is included in each plan, as well as a firewall, and you can upgrade to Norton Antivirus products for $5.95 per month. This might not be necessary if your computer or device has built-in security software, but it’s certainly good to have as an option, particularly in the age we are living in now. Digital isolation remains an issue in rural and remote communities across the United States. Although companies are working to expand wired provision out to previously neglected areas, this endeavor moves at a glacial pace. It’s the reason why satellite services are still a necessity. Until recently, EarthLink provided independent satellite internet, but it now offers HughesNet infrastructure under its own brand. While satellite connections aren’t the most reliable (an issue across the board, not just with EarthLink), they are a lifeline in some areas. The importance of these connections mustn’t be underestimated. As part of EarthLink’s dial-up internet plan, which offers unlimited usage, customers can access the internet from anywhere with a phone line. It’s the perfect way to stay connected when hotel Wi-Fi is either grossly overpriced or patchy at best. Toll-free dial-up numbers for all areas are listed on the EarthLink website, and it’s simply a matter of selecting the right one for the area you’re visiting, connecting to the phone line (bring your modem! ), and dialing up as usual. Unfortunately, Earthlink is not well-known for its glittering customer service. The year 2005 was a difficult one for the business, and cost-cutting measures included closing down US call centers, resulting in thousands of job losses. Customer service is now outsourced to international representatives, and customers often report that a language barrier can make it difficult to have meaningful resolution of problems with the service. The same is true of technical support. Since the restructuring in 2005, maintenance is now performed by third-party technicians, and quality tends to be hit-and-miss. Customers can contact support services by phone, email, and live chat. It can take several days to receive a response by email, and phone wait times are often long, so live chat is recommended in the first instance. That said, the online help section of EarthLink’s website is full of genuinely useful troubleshooting pages, as well as tricks and tips for optimal use of the service. Earthlink offers internet connectivity at rock-bottom prices. With other providers, it’s possible to make savings by purchasing your own equipment, or skipping on installation. With EarthLink, both of these are mandatory to use their service. Still, there are choices you can make within the service to keep costs down. For example, unless you have heavy-duty requirements online, the DSL Internet option is perfectly suitable. Instead of spending $40 on a service you don’t need, opt for the $15 plan. And if you absolutely do not need broadband at all, give dial-up a try to save another $60 over the course of a year. Note that EarthLink charges extortionate prices for early termination of a contract, from $90 for DSL, up to an eye-watering $200 for Hyperlink Internet. If there’s any possibility that you’ll be moving home within a year, it’s best to look for a more flexible provider and save yourself the financial hit. For the budget-conscious, there’s simply no cheaper way to access the internet than taking out a plan with EarthLink. The dial-up and DSL services are unbelievably inexpensive, making them a superb choice for light internet users. The Hyperlink Internet plan is reasonably priced, but the absurd modem and installation fees, as well as the $200 early termination penalty, are entirely disproportionate. Competing providers make concessions in terms of free equipment, complimentary installation, or flexible contracts. Some offer all three. To be frank, nothing stands out about Hyperlink Internet, aside from the extortionate charges. Conversely, the Satellite Internet service is a great option for digitally isolated communities, and can work out slightly cheaper than HughesNet’s own service. EarthLink is therefore a worthy contender in this sector. Whilst it’s advisable to look elsewhere for high-speed broadband, we’d recommend EarthLink for inexpensive entry-level access, as well as connectivity in remote locations. Customer service is horrible. Language barrier is extremely frustrating. Customer service is horrible. It takes two hours on the phone and your issues are not solved.Having worked in customer service I fill for the representative but , this has to improve. They tell me it’s the line. I told them that the first day.